U.S. retail sales of Class 8 trucks in January jumped 32.1% to more than 14,000, WardsAuto.com reported, as signs of a strong economic expansion increased. Sales hit 14,458 compared with 10,944 a year earlier. All truck makers posted gains over the 2016 period. The improved sales come as the freight market is as strong as it has been in nearly 40 years, or since federal deregulation of the industry in the 1980s, beginning with the Motor Carrier Act of 1980, according to American Trucking Associations Chief Economist Bob Costello. “The three major buckets of freight are all doing well right now,” Costello said during a presentation at the recent Natso Connect conference, referring to consumer spending, the construction market and manufacturing output. Meanwhile, ACT Research Co. is forecasting a strong boost in Class 8 sales this year. 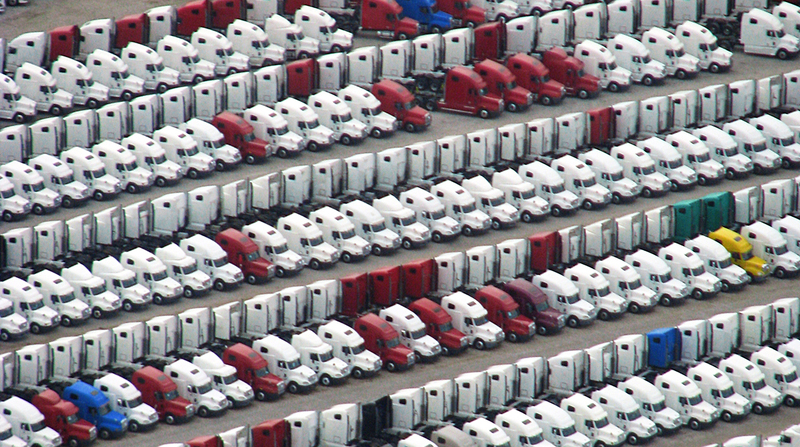 “As we grease the wheels of the economy with tax-savings dollars and as things like freight and services start to increase, I think the people who are betting with their dollars [on new truck purchases] now are trying to position themselves to take advantage of that, if and when it happens,” ACT Vice President Steve Tam told Transport Topics. ACT forecast U.S. and Canadian retail Class 8 sales to increase by about 25% in 2018 compared with 2017. However, Tam said January’s numbers would suggest a potential upside for that market. But if that is the case, then the industry ends up with over-capacity situation sooner and you get a steeper downturn on the backside of the wave, Tam said. ACT reported the actual total was at 251,800 Class 8 trucks sold in North America in 2017, and it is expecting 314,500 will be this year. Canada accounts for about 10% of those sales, Tam said. January posted a solid number and a 38% increase is what you would expect given that a year earlier was a weak market, said Don Ake, vice president of commercial vehicles at the research form FTR. Freightliner continued its run as the market leader in Class 8 sales as it reached 5,228 units, good for a 36.2% market share, and a 28.2% improvement over 4,077 sold a year earlier. Freightliner is a unit of Daimler Trucks North America. Western Star, DTNA’s niche vocational brand, sold 372 trucks, good for a 2.6% share, and 36.8% improvement over the 272 sold a year earlier. International, a unit of Navistar International Corp., claimed a 14.9% market share on sales of 2.159. That was a 67% improvement on 1,293 in the 2017 period. The three major buckets of freight are all doing well right now. “We are really excited about what we see in the marketplace, what’s going with our trucks and the acceptance on behalf of the fleets. We are really bullish on what is going to happen for the rest of 2018,” said Jeff Sass, Navistar International Corp.’s senior vice president for North American truck sales and marketing. Among truck buyers, premium comfort and productivity features remain a high priority amid efforts to recruit the best professional drivers, said Magnus Koeck, vice president of marketing and brand management at Volvo Trucks North America. VTNA, a unit of Volvo Group, sold 1,266 trucks, good for an 8.8% share, and a 7.5% improvement on 1,178 trucks sold a year earlier. “Confidence in the economy continues to drive strong freight volumes and rates, creating a market that’s poised to invest in new, more efficient and technologically advanced equipment,” Koeck said. Mack Trucks, also a Volvo Group brand, sold 1,228 trucks, earning an 8.5% share, and improving 14.8% on sales of 1,070 in the 2017 period. Mack expects 2018 will present both opportunities and challenges as it continues to focus on maximizing customer uptime. “Customer response to our great new products, including the Mack Anthem model, has been overwhelmingly positive. And while we’re excited about the forecasted strength in the Class 8 market, we’re also keeping a close watch on potential disruptions in the supply chain that such robust activity can bring,” said John Walsh, Mack’s vice president of marketing. Also, Peterbilt Motors Co. sold 2,503 trucks, earning a 17.3% share, and improving 34.4% on 1,862 sold a year earlier. Kenworth Truck Co. sold 1,693 trucks, good for an 11.7% share, and an improvement of 42.5% over 1,188 in the 2017 period.